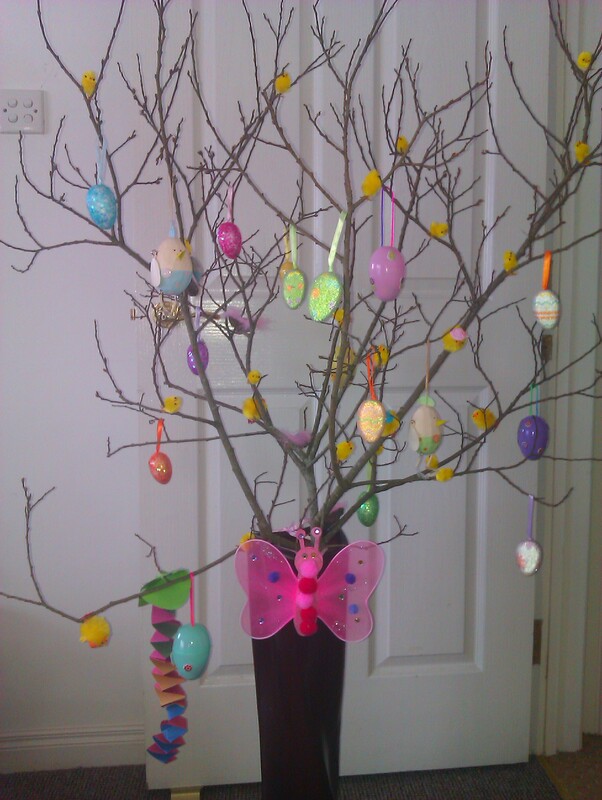 This post will not be my typical healthy living entry as such but because Otilia, from Romanian Mum was so keen to find out :-), I will tell you about our new family tradition, an Easter tree!! So last night I sent hubby to find a sturdy tree branch. Fortunately for him, there are loads literally lying around as in preparation for a new road layout and he didn’t have to look long or do anything illegal 🙂 I had bought from PoundLand a few bags of small and medium fluffy chicks, three decorative egg types and some very cute miniature nests. Emma was fully on board with this, helping me hang the eggs, decorating the hollow ones with stickers and filling them up with small treats like chocolate coins and mini-chocolate eggs. The result was amazing and I was so pleased with it I was still raving this morning about it :-). The entire cost, including the sweets, the decorative butterfly Emma had done last week (Home Bargains buy) and all the things mentioned above? Less than £10 but my living room looks a million dollars to me now!! Hey lady that you so much! It such a lovely idea and it looks amazing! Next PostHealthy Living Challenge: Day 26 – 5 Ingredients, 50 Minutes, 500 Calorie Dinner!